Evelyn Piazza and Debbie Debrick are two members of the Anti-Hazing Coalition, a group that aims to promote anti-hazing legislation across the country. Evelyn, who lost her son Tim to hazing in 2017, turns her grief into action by going to universities across the nation and sparking a conversation about the dangers of hazing. Evelyn became an activist against hazing with hopes that she could help prevent others from experiencing the same type of pain that she and her family have endured. On February 27, 2019, JMU Fraternity and Sorority Life provided a platform for these advocates to speak directly to JMU students in Memorial Auditorium at 7 pm. Evelyn provided an emotional testimony about the dangers of hazing. “To find out that [hazing] happened again and again and again in 2017 and that other families had to live through this pain, we had to do something. We have to make it stop so that people don’t have to go through this. Because it’s just the worst. It’s the worst to know how your child suffered,” explained Evelyn. 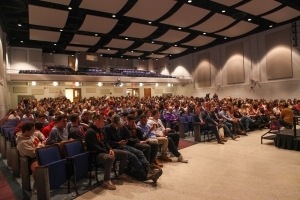 The auditorium was filled with students concerned about hazing. 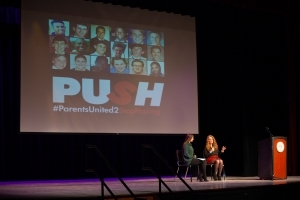 Several were inspired to discuss their own experiences with hazing. Austin Wood, a junior health science major has seen the effects of hazing first hand. Memorial Auditorium was filled with students concerned about hazing. The event began with a moving speech from a friend of Tim Piazza, Michaela Koep. 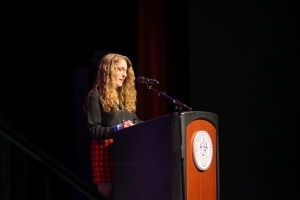 She set the tone for the evening by discussing the gravity of hazing and the long-lasting effects that it can have, evident in the deaths of Tim Piazza and Dalton Debrick. Unfortunately, Debbie Debrick, mother of Dalton Debrick, was unable to attend the event due to travel complications. Dalton’s story was still heard as Evelyn gave Debbie’s emotional testimony in her stead. Despite her absence, the love that Debbie has for her son was overwhelming and brought several audience members to tears. These tears continued to flow as Evelyn spoke about her own son. She gave the audience members a unique experience by asking them to put themselves in the place of Tim’s brother as he lost his best friend. Through this, Evelyn helped the audience empathize a fraction of the pain and heartbreak that her family went through after losing Tim. Throughout the night, it became clear that victims are not the only ones who experience the consequences of hazing. As Evelyn pointed out, hazing laws vary from state to state, but most recognize it as a misdemeanor. This includes Virginia, where the penalties include a fine of $2500 and up to 12 months in jail. Legally, hazing is classified as intentionally causing physical or bodily harm to a student as an initiation into an organization. Even if the victim consents to the activities, the state of Virginia does not count this as a defense for hazing. Evelyn and Michaela answered questions submitted by audience members. Evelyn continued the conversation by discussing assumptions surrounding hazing. While the stereotype suggests that it only affects members of Greek organizations, that is not the case. Every type of university organization has the potential to promote hazing. Marching bands, sports teams, and academic organizations all have a history of performing it and the potential to continue. As Evelyn highlighted in her speech, everyone has a responsibility to stop this trend. As students, this can be achieved by not participating in organizations that promote hazing, not allowing people who have an interest in hazing to be a part of your organization and reporting people or organizations that have a history of hazing. Be the change you want to see. The main message that Evelyn and others who have suffered losses at the hands of hazing want to spread is that hazing is wrong and must be stopped. In many cases where the victim died from hazing, the death could have been prevented if someone called for help. Do not be afraid to call for help if you think someone may be in a life-threatening situation. Due to medical amnesty laws, you will not be charged if you bring someone to the hospital for illegal substances or underage drinking. Do the right thing—be the difference between life and death. If you suspect an organization may be promoting hazing, you can report it anonymously by calling 1(888)-NOT HAZE or contact Fraternity and Sorority Life.